Have you discovered our Online Bookseller Help Pages yet? The Bookseller Help pages were set up to better assist our booksellers with any account queries they may have. Visit the online help pages as your first stop if you have a question. Whether you have a query about how to request extra shipping, how to refund an order for a specific reason, the book data options you may have, the best practise tips that will help you improve your sales potential, you will find it here. How can I become an AbeBooks bookseller? Upload and manage your inventory. How can I process my orders? Processing returns, refunds and cancellations. If you can not find the answer to your query there, you are still always welcome to contact our [Customer Service Team] who are happy to assist! You may have noticed already that we have updated the AbeBooks homepages. A re-design was implemented as a means of improving user-friendliness and making it easier for buyers to find the books they are looking for, as well as drawing their attention to the different features and promotions offered. The new design was tested and approved by a group of AbeBooks users before its release earlier in July. 1) We have a set of more visual, clickable "buttons" linking to different specialist areas - the Rare Book Room and Large Print Books and Free shipping room for example. 2) You can find a list of the Top 10 bestsellers taken from various sources. This is available in different languages for each market. For the UK market we have The Times Online's Top 10, The Guardian's Top 10, and of course the AbeBooks Top 10. 3) We have made it easier to find the website in your preferred language, by adding user-friendly visual links - defined by the corresponding country flags. 4) We have also made it easier to navigate the site. In the footer you will find, among others, links to the contact details, company information and other websites. The re-design not only makes the homepages more modern and user-friendly, but also goes some way to improving the search functionality from other search engines. 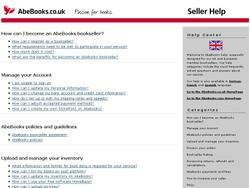 AbeBooks.it - bookseller site now live! As you will remember, earlier this year, we released the AbeBooks.it website for Italian buyers. We are happy to announce that the second step towards full integration into the Italian book market has been completed with the successful launch of the bookseller functions in Italian. What this means is that Italian booksellers can now enjoy the Members Menu in their own language, along with all the functions that go with having a bookseller account on AbeBooks! With some 28 million internet users and a large established antiquarian book market (more than 2000 booksellers) in Italy, we are pleased to now be able to offer both book buyers and booksellers a service in their own language. This new service will help to attract new buyers and sellers to the AbeBooks community. More sellers means that we will have more unique inventory available, which will in turn bring more buyers to the AbeBooks websites. Remember, Italian buyers don't just buy Italian language books, they are very often looking for English and French language books too. With the launch of the Italian buyer and seller websites you may notice an increase in sales from Italian buyers in the coming weeks and months - don't forget to update your shipping matrix if you have not already done so. Any booksellers wishing to have Italian as their preferred language can do so, by signing on to their account on www.abebooks.com and changing the language settings on the Your Personal Information section of their account. We also offer our Bookseller Help Pages in Italian as well as Customer Service. Further tools planned for the Italian market include the integration of an Italian ISBN catalogue for ISBN matching purposes, which is planned towards the end of this year. Last month, in our Completion Rate Initiative Update, we informed you about the great success of the current completion rate initiative. As a result of that success we have been looking into ways to further improve the overall completion ratings. The aim is to help to increase customer satisfaction even further - after all a happy buyer is a repeat buyer, generating more sales for your books. The large majority of our booksellers have an excellent completion rating, between 85-100% and therefore a Bookseller Rating of 4-5 stars. As part of a new completion rate initiative, starting from August 2008, we will be contacting those booksellers whose completion ratings lie below 85% (the monitor was previously set at 80%), and who have a large number of cancelled orders. After the initial warning email in August, booksellers will have a 3 month period in which to adjust to the new monitor and to improve their completion ratings. We will only proceed to actively suspend accounts, where no improvement has been made despite our emails, in November of this year. Please be assured that our Customer Service team will be here to help and guide you, ensuring that you are able to meet the 85% requirement. We are pleased to announce the new addition to the Gojaba.com family. On 22nd July the Polish Gojaba (pl.gojaba.com) website was successfully launched, joining the already successful Russian, Swedish and Brasilian websites. Gojaba.com offers a low-cost, no-frills, online market place for booksellers of used, rare and out of print titles in emerging markets. As a reminder, the Gojaba.com website works as a listing platform only, providing the link between buyers and sellers. There is no commission and the sales are completed between the buyers and sellers directly - Gojaba.com has no part in that process. Buyers can select their language - Russian, Swedish, Polish or Portuguese and can search for books of their choice in their own language. In the last 5 months since the launch of the first Gojaba.com websites, the number of books has risen steadily to over 700,000, listed by 150 booksellers in 16 different countries. Book buying is becoming ever more popular in Poland and are currently the most sought after items online. This, along with the fact that there are more and more internet users appearing throughout Poland, makes it a very interesting market to tap into. Many Polish antiquarians are already gearing up to take advantage of the new internet era. Gojaba.com provides buyers with an easy method of finding the books they are looking for, and booksellers with a low-cost sales channel, not just in Poland, but worldwide. Please be advised that we are currently experiencing some delays in the processing of book files. We ask you for your patience whilst we work to resolve these issues as soon as possible. In the meantime, we ask that booksellers do not repeatedly attempt to upload files to AbeBooks, and do not initiate a purge and reload as this will contribute to further delays in the file conversion and indexing process. We thank you kindly for your patience and understanding and will of course update this post again as soon as we can confirm that the problem has been resolved. This set includes 25 total volumes including 8 printed between 1736 and 1750 as well as 16 volumes printed between 1759 -1765. It was one of the first works to attempt to unify the history of Western Europe with the stories of the world's other known cultures. A tourist souvenir which includes 100 of the most scenic landscapes from around Switzerland. Published by Briquet and Dubois circa 1850. One of 550 first edition numbered copies, signed by De Kooning (1904-1997). Illustrated with 17 original lithographs, bound in black goat-skin, stamped in gold and encased in a linen clamshell box. 70 volume set of Realencyclopädie der Classischen Altertumswissenschaft,the German encyclopaedia of classical scholarship. Set includes 30 volumes in the original Half-leather binding, 21 volumes in dark blue, modern original full linen binding, 19 volumes in the original paperback binding. This is of the edition Georg Wissowa began in 1890. First Edition, first printing from 1976, with the both authors inscriptions to the title page. In three volumes printed from 1650. Daniel Sennert (1572-1637) was a celebrated German physician of the 17th century who is usually given credit for the first clear description of scarlet fever. This copy contains Brown Ink Signature Inscription of astronomer John Goodricke (1764-1786), who became deaf as a child due to scarlet fever. First edition from 1971, limited to only 1,000 copies. Includes Map. Classic work of The Gentle Libertine from 1909 written by the admired, and controversial, French writer Colette. Please be advised that we are currently experiencing some technical difficulties with our file processing system, which has resulted in delays in amending the search results. We ask you for your patience whilst we work to resolve these issues as soon as possible. In November 2006 we started to work quite intensively with those AbeBooks booksellers who had an unusually high number of cancelled orders and who were therefore not actually meeting AbeBooks' order completion requirements. The purpose of this initiative was to improve customer satisfaction and increase customer confidence in online-purchasing with our booksellers. Since the initiative started the average completion rates have increased across all AbeBooks marketplaces by several percentage points. This is a huge success and we would like to take this opportunity to thank all of you for actively working to increase your completion ratings. Not only does this improve customer satisfaction and encourage buyers to purchase your books with the confidence; it also means an increase in sales revenues for you if you can fulfil more of your orders. As the initiative has been so successful, we will continue to work with our sellers to improve the completion ratings even further. Review our Completion Rating tips.